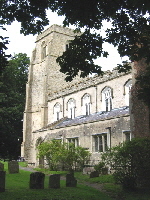 The parish church was dedicated to All Saints by 1441. It was once cruciform in shape with a central tower. The proportions of the building are typical of an Anglo-Saxon church of high status, perhaps a minster, but churches of that form were still being built after 1066. The oldest surviving feature above ground is a small round headed window on the left of the main door. The window is carved from a single block of stone, scooped out underneath to form an arch and very simply decorated with round circles. It dates back at least to the late 11th Century and is thought to be possibly pre-conquest. In 1871, Lord North and his wife Frederica (who had converted to Catholicism in 1867) built a temporary church of corrugated iron in the grounds of the tower in 1871. This was replaced by the present church in 1877. By 1775 there was a meeting house on the south side of Kirtling Green, which belonged to a grocer called Thomas Canham. The congregation was Particular Baptist by 1825 and never joined the Baptist Union. A new chapel with capacity for 200 people built on the same site in 1847 but was demolished in early 1820s. By 1874 the Primitive Methodists had built small red brick chapels in Kirtling and Upend. 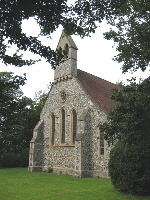 The Upend chapel was disused by 1953 and the last service in the Kirtling chapel was in 1975. There was a parish school master recorded in 1723. From 1767 Francis North, earl of Guildford, paid for the education of eight poor children. In 1818 there was apparently no school, and classes were apparently taken in the south aisle of the church. A national school and master’s house was build in The Street in 1850 partly at the expense of Kirtling estate. This was extended in 1872. Attendance peaked to over 100 in 1910 but had dropped below 50 by 1938 and 25 in 1950. 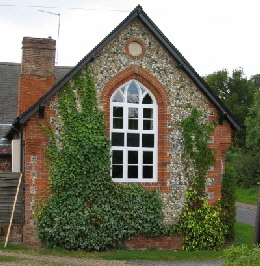 The school closed in 1980. W North founded a girls’ orphanage around 1871. It was initially run by the Nuns of the Servants of the Sacred Heart of Jesus in the form of almshouses. Though the nuns left around 1876, the orphanage continued until 1880.